Great stay, but internet connection was a little irregular and could be improved. Loved the cleanliness on the shared bathrooms, and location was perfect. 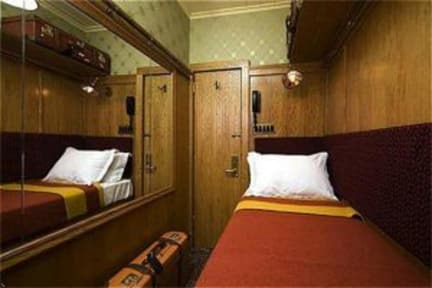 Our room was small and cozy, private, with only one bunk bed but my husbad and I slept comfortably. After checking out, the staff secured our luggage so that we could still explore the city. Overall, a great experience, friendly staff, and affordable for an upscale area. I would definitely recommend staying at The Jane. Nice, clean place. Had solo small room for fraction of price vs nearby hotels. I love this place! I will be staying here every time I visit NYC. I would recommend some earplugs. The rooms are smaller and the doors are closer in proximity. This means you may be woken up but a door closing from another room throughout the night. No fault of the hotel. Super cool historic hotel with private "cabins" built for sailors and large, clean shared restrooms at the end of the hall. All 100% great except for a little bit of noise from the bar? club? downstairs. But it was Saturday night, and I didn't have any problem falling asleep. The air conditioner almost drowned it out. Great staff, great location. I had a great stay, for the price and location you can’t beat it . I will definitely stay again. They are very pleased. :) If you don’t mind the size of the room, I recommend this hotel. Loved my stay at The Jane! It's a very romantic portal back in time. My single cabin was cozy and comfortable. The hotel breathes fresh air through windows that open! Time has stopped in the most fascinating ballroom. Great building but its the fine service from the friendly staff that made my at The Jane so enjoyable! Everyone from the front desk, to the bellmen, to the barman, to housekeeping staff even the engineer I needed early Sunday morning made me feel welcome. Can't wait to go back! 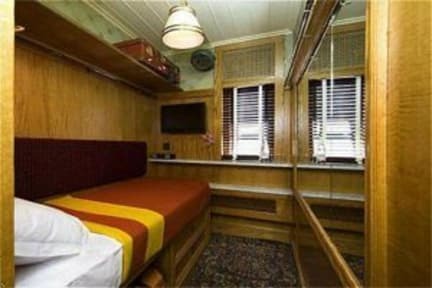 Single room with twin bed, used by sailors a the turn of the century. Well heated, lots of storage space. Great food and friendly atmosphere in the restaurant. Hotel provides slippers and a long robe for walking to the non-gender specific bathroom/shower. Pretty relaxing in the evening, not much noise until around 9am. One of the more affordable hotels in NYC at this time of year (early December), but still more than I would normally pay, especially for a room of this size.